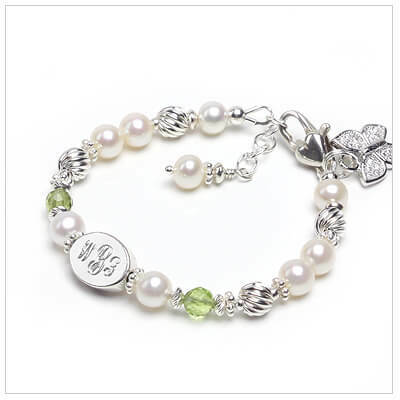 Personalized baby and children's bracelets with custom engraving is our customer's favorite. 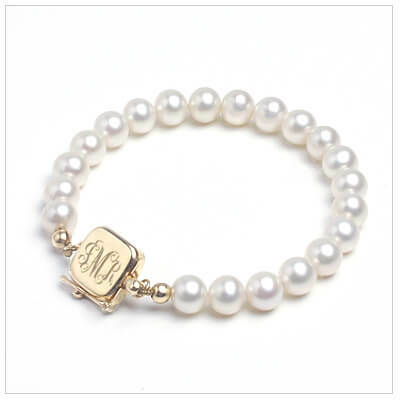 Girls pearl bracelets personalized with a name or monogram, plus ID bracelets for girls and boys. 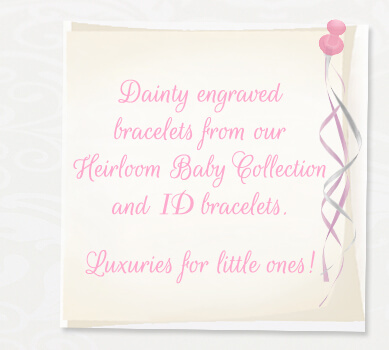 Find your favorite in our elegant collection of engraved bracelets for babies and children. Customer favorite! 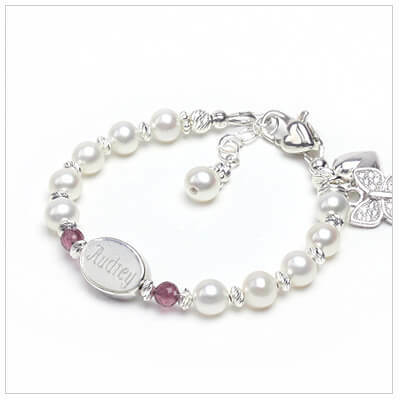 Baby bracelet in beautiful cultured pearls with custom engraved sterling clasp. 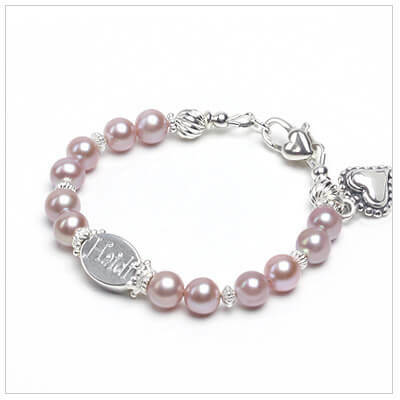 Cultured pearl bracelet for girls, sparkling crystal rondelles, personalize front & back. Baby bracelets. 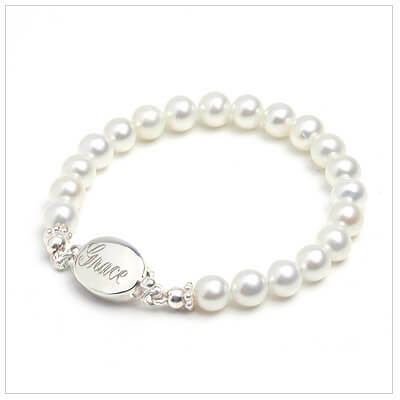 Gorgeous pearl bracelet for baby & child with genuine birthstones and sparkly diamond cut sterling. Fine cultured pearl bracelet with genuine birthstones and custom engraving. Baby/ child bracelet. 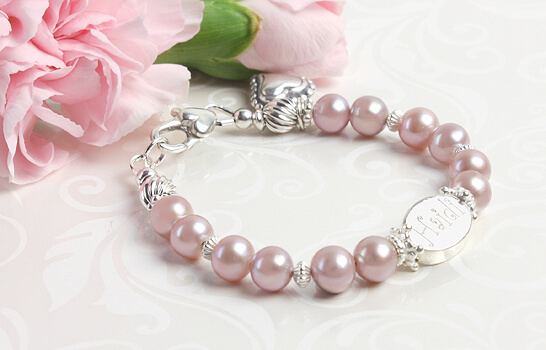 Beautiful pearl bracelet for baby and child with pink crystals and crystal-set sterling. Charm included. Customer Favorite! 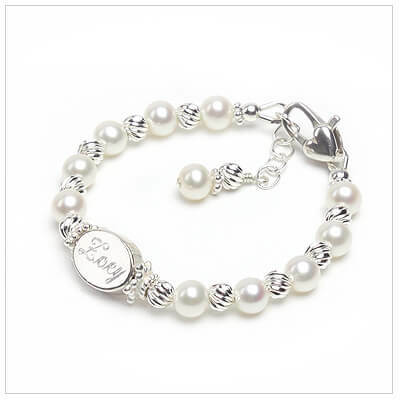 Fine cultured pearl baby bracelets. Custom engraving on the 14kt gold safety clasp. Favorite! 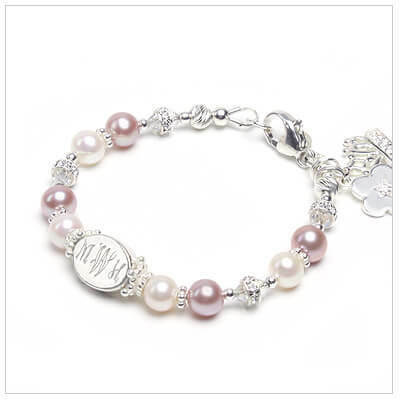 Mauve or white cultured pearl bracelet with personalized bead for babies, toddlers, children. Precious sterling silver baby ID bracelet in small sizes. Engrave front and back. 4 - 5.5 inches. 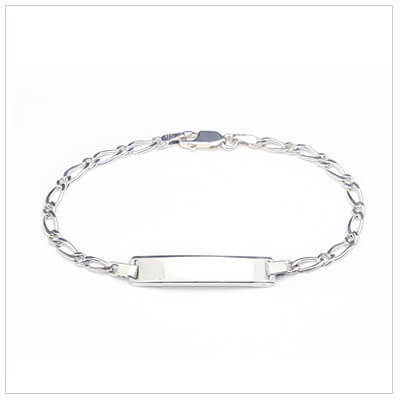 Sterling toggle style baby bracelet with a genuine diamond. Free engraving on heart. Baby jewelry. 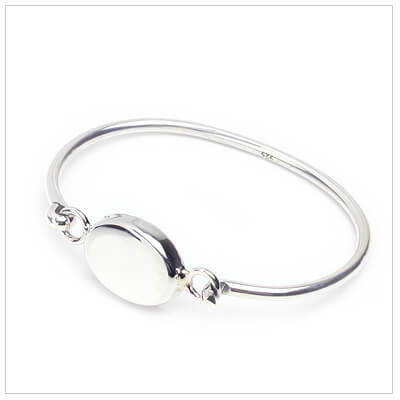 Children's silver bangle bracelet with oval puffed front. Free personalized engraving. 6 inches. 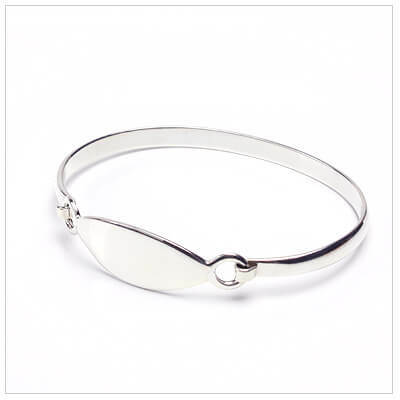 Silver bangle bracelet with oval puffed front for toddlers. Free personalized engraving. 5 inches. 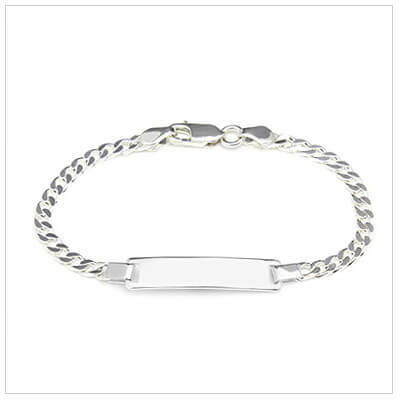 Sterling silver ID bracelet sized to fit babies and toddlers. Engraving included. Available in 4 sizes. 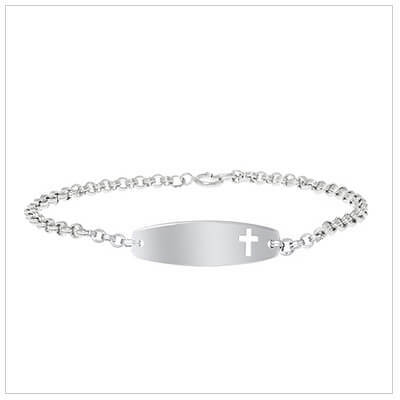 Sterling silver ID bracelets for kids with a Cross cutout. Great for boys or girls. Size 6.5 inches. 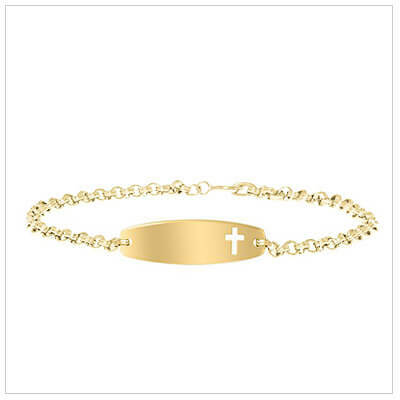 14kt gold filled ID bracelets for kids with a Cross cutout. Great for boys or girls. Size 6.5 inches. Sterling silver ID bracelets for girls with genuine diamond. Engraving included. Size 6.5 inches. 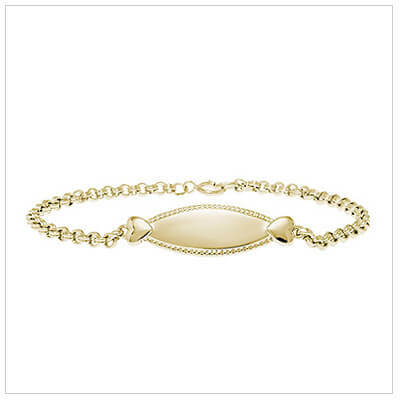 Gorgeous 14kt gold filled ID bracelets for girls with two small hearts and beaded border. Size 6.5 inches. 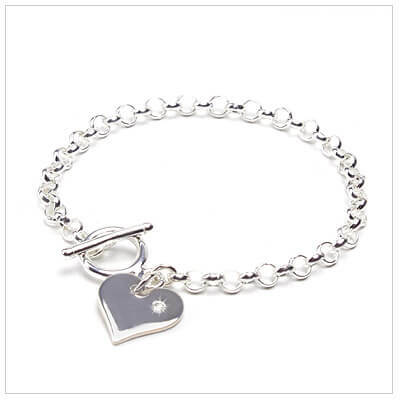 Precious sterling silver ID bracelets for girls with two small hearts and beaded border. Size 6.5 inches. Precious! Sterling silver ID bracelets for girls with genuine diamond on the flower. Size 6.5 inches. 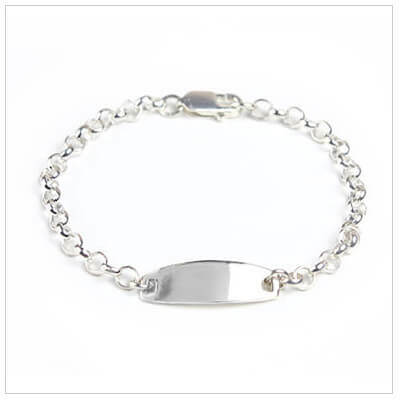 Sterling silver girls ID bracelets in a classic style. Engrave front and back, included. Size 6 inches. 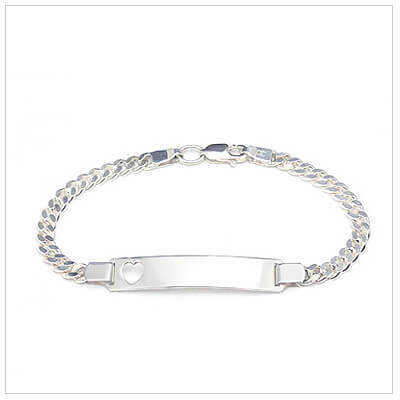 Sterling id bracelet for girls with a heart cut out and curb chain. Size 6 inches. Silver bangle bracelet with marquise shaped front personalized for kids. Toddler size 5 inches. 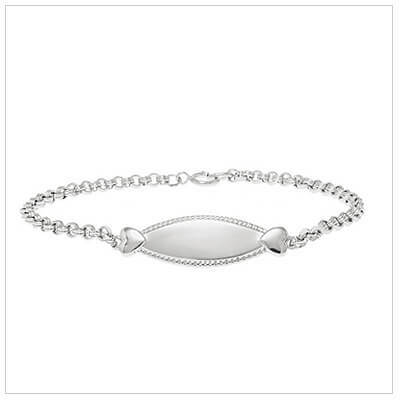 Marquise Silver Bangle Bracelet 6 in. Silver bangle bracelet with marquise shaped front personalized for kids. Children's size 6 inches.